Introduction Patterns of cough in tuberculosis influence transmission of disease yet have been little studied. We report the prevalence, duration, severity and frequency of coughing in tuberculosis. Method The first part was a retrospective review of the medical records of all individuals diagnosed with pulmonary tuberculosis (PTB) at our hospital during 2012–3. The reported presence and duration of coughing was noted. In the second part of the study, successive patients with an ultimate diagnosis of PTB wore the Leicester Cough Monitor for 24 h prior to commencing treatment. 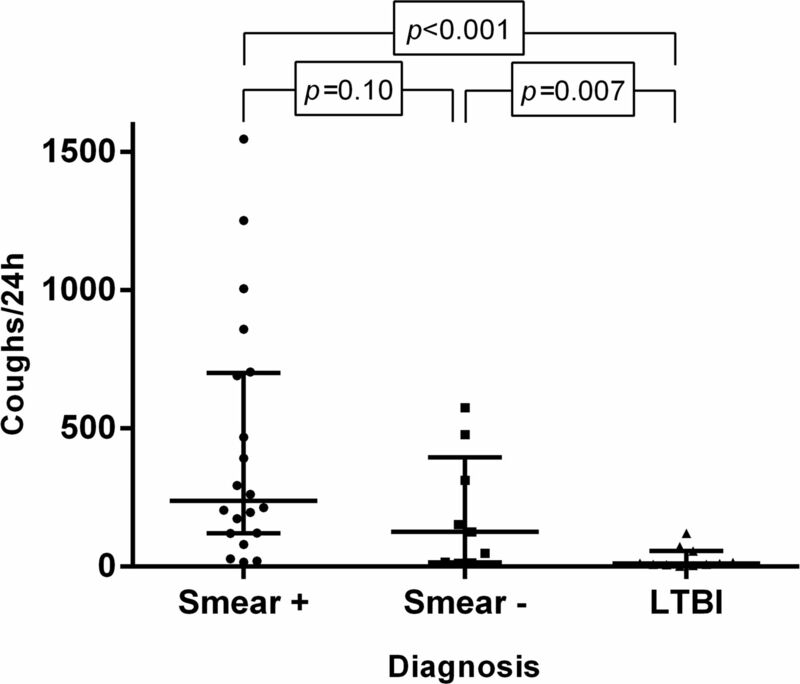 Controls had latent TB infection (LTBI). Participants rated their cough severity from 0–100 with a visual analogue scale (VAS). Cough characteristics were compared with other clinical variables. Results 108 cases of PTB from 2012–3 were included. 82 reported cough of median (IQR) duration 4 (1–8) weeks. There was a significant association of the presence of cough with TB sputum culture positivity (odds ratio, 11.0; 95% confidence interval, 2.5–50.0) but not gender, smoking, smear positivity, cavitary disease or extent of radiographic change. No clear predictor of the duration of cough was identified and there were too few patients to estimate the effect of TB strain. Cough frequency was measured in subjects with sputum smear positive PTB (S+; n = 20), smear negative PTB (S-; n = 10) and LTBI (n = 11). Variability was high: median (IQR) cough rates were 238 (121–701), 126 (15–395) and 11 (7–56) coughs/24 h, respectively, and not significantly different for S+ vs. S- (figure). For active TB, cough rates were reduced overnight (2.8 [0.2–12.4] vs. 12.7 [3.3–23.4] coughs/h for night vs. day, respectively; p = 0.01). No effect of smoking was detected, nor was there a correlation between cough frequency and radiographic extent of disease, cavities or time to sputum culture positivity. Cough severity was higher for S+ than S- but also variable and the difference not statistically significant (VAS: 60 [13–94] vs. 22 [1.5–70] respectively; p = 0.41). Severity correlated with cough frequency in active tuberculosis (Spearman’s r = 0.60, p = 0.001). Conclusion Cough in TB reduces overnight and is related to culture positivity. Bacterial burden and extent of disease may not be important. Other determinants of cough await characterisation.